[Entry 14] In Florence and Tired. This (and the last one) are about 12 hours late, because of lack of internet. It is now the morning, and I am no longer tired. 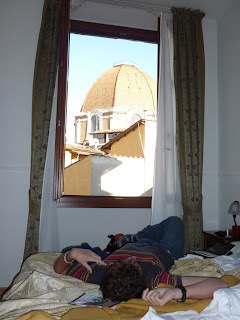 We arrived in Florence this morning at about midday. Dad put me in charge of booking a hotel the night before we left Egypt. So we're in this little place called the Hotel Centrale, around the corner from the Duomo (the big church thing) and the train station. I'm really good at finding hotels. The hotel has a really good door. We didn't do much else today. We wandered around Florence for a bit, looked at the outside of some churches and art galleries (we'll do the insides tomorrow, I guess). Then I accidentally fell asleep, and by the time I woke up it was dark and we went out for dinner via some more monuments. Some kind of art gallery. The Duomo (cathedral). I am eating ice cream for some reason, even though it's 4 degrees. Italian Italian food is really good, by the way. Plus they had prosciutto, which was amazing because I haven't had bacon or anything for over a week now, since they don't have it in Egypt. And I need my bacon. Florence is a complete opposite to Cairo. It's clean, for starters. They have street markets, but much more sedate than Egyptian ones. And it's a lot calmer and more chilled. And very, very European. Overwhelmingly European, as much as something can be overwhelmingly European, since European-ness is all about being cool and suave. I think I'd find it easier to live here than in Cairo, except that I feel kinda dorky in a T-shirt and jeans when everyone's all slick and European (how many times have I said that word now?). At least I'm not wearing a bright orange ski jacket like dad. I said this one would be quick. I'm really tired, and dad's already snoring. Night.